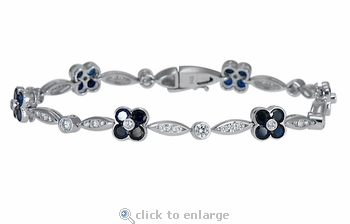 Our Florinada Flower Style Round Cubic Zirconia and Man Made Sapphire Gemstone Bracelet is a spectacular bracelet that is captivating and fashionable. 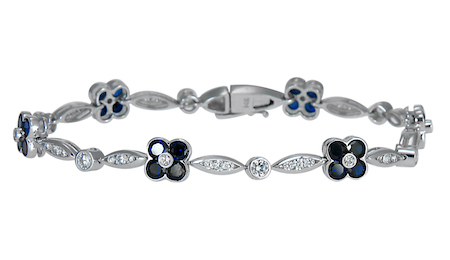 A multitude of sapphire blue lab created round gemstones are perfectly set to resemble flowers. Additional rounds are bezel set and accent between each flower. 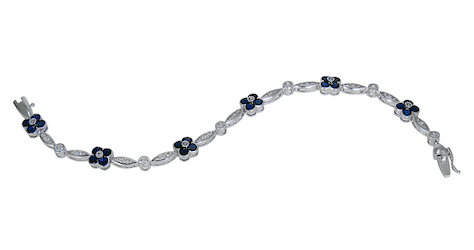 The Florinada Bracelet measures 7 inches in length and secures with a single safety clasp. The total carat weight is approximately 6 carats ofthe finest hand cut and hand polished original Russian formula cubic zirconia. This bracelet is available in 14k white gold or 14k yellow gold and in your choice of a 7 inch length or upgrade to an 8 inch length, please see the pull down menu for options. For further assistance, please contact us directly at 1-866-942-6663 or visit us via live chat and speak with a knowledgeable representative.